Aggarsen jayanti celebrated: Glowing tributes were paid to Maharaja Aggarsen on the occasion of Agarsen Jayanti here on Saturday. A function was organised by the Aggarwal Sabha, Sunder Nagar, to mark the occasion. The speakers recalled the concept of Maharaja Aggarsen of ‘one brick and one coin’ for building up cities. They said it could help to bring universal brotherhood and remove economic inequalities. The Minister of Science and Technology, Punjab, Mr Rakesh Pandey, announced to give Rs 1 lakh to the sabha. 150 examined: More than 150 patients were examined and medicines were given free of cost at a homeopathic and diabetes check-up camp here on Sunday. The camp was organised by the Lions Club at Lions Bhavan. A team of doctors comprising Dr R.K. Verma, Dr Ravinder Kochhar and Dr Vipin Gupta conducted the camp. Prominent among those present at the camp were Mr R.K. Miglani, Mr G.S. Chauhan, Mr R.K. Garg, Mr D.J. Jain and Mr K.K. Verma. Computer education: Mr Joginder Singh Aulakh, DEO, Sangrur, called upon leaders of various social and educational societies to aware rural people about the significance of computer education in different aspects of life. Mr Aulakh was interacting with office-bearers of various organisations after addressing concluding function of Computer Education Teacher's Training Programme at Government Senior Secondary School, Kanganwal, on Saturday. Dental check-up camp: The district unit of the Indian Dental Association, under the Child Dental Health Education Programme, organised a dental check-up camp at Government Senior Secondary School, Langroya, about 5 km from here, on Saturday. Dr Ashwani Dhir, Dr Rakesh Chopra, Dr Neetu Gupta, Dr Meena Rana and Dr Amandip Singh, Dr Gurpal Arora and Dr Sushma Sharma, examined as many as 575 children. School wing inaugurated: Mr Parkash Singh, Parliamentary Secretary, inaugurated the newly constructed wing of Government Senior Secondary School here on Saturday.He said a sum of Rs 15 crore had been spent under the Sarv Shikhiya Abhiyan to improve infrastructure facilities in government schools in the district. Mr Lalit Mohan Pathak, president, Municipal Council, Mr Gurmail Singh Sahlon, DEO, Mr Iqbal Singh, Principal, Mr Balihar Singh Bains, District Science Supervisor, also addressed the gathering. Lok Suvidha Camp: The district administration organised a Lok Suvidha Camp at Government Senior Secondary School, Banga, 13 km from here, on Saturday for providing on-the-spot delivery of services relating to different departments to residents of as many as 110 villages falling under Banga, Behram, Mukandpur and Jandiala Kanugo circles. Mr Balwinder Singh Multani, ADC, presided over the function. BOARD: The state government should set up a Artisan Development Board on the same lines as Kerala to help artisans who were left jobless due to the rapid growth of industry said the national working president of Artisian, Mr V. Viswanadhan on Saturday while addressing a press conference here. He said the government should provide loans to artisans to start their own work. EXPELLED: The executive body of the PGI Employees Union, (Group B, C and D employees) in a press note said that Mr Lekh Raj, Hostel Manager of the PGI, had been expelled from the union. Mr K.K. Yadav, general secretary of the union, said that Mr Lekh Raj, who was appointed as Chief Electoral Officer to conduct elections of the union for 2005-06, had been expelled following his failure in handing over the membership registration books, membership lists, statement of expenditure of elections and for not depositing the unspent funds to the union. In another case, Mr Budh Ram, sanitation attendant, who was issued a show-cause notice on the charge of anti-union and anti trade-union activities, replied to the notice. Office-bearers: The following have been elected office-bearers of the Army Welfare Housing Society, Sector 47: president — Col H.K. Dev; vice-president — Lt-Col G.S. Thakkar; general secretary — Lt-Col B.K. Sodhi; treasurer — Lt-Col V.K. Nayyar. counselling: Sultan Chand and Sons Ltd organised a workshop of career counselling for students of class XI and XII (Commerce) in Shivalik Public School, Phase VI, here. The counsellors were Prof J.K. Bareja, Chairman, Career Awareness Committee, Institute of Company Secretaries of India and Prof Bharat Bhushan, Reader in Commerce, Hans Raj College, University of Delhi. Various career options related to the commerce field were discussed with special reference to MBA, CA and CS. TENTH ANNIVERSARY: The AIMT, Ambala City, on Sunday celebrated a decade of excellence in imparting technical education to its students. Ms Promila Issar, Financial Commissioner and Vice-Chancellor of BPS Mahila Vishwavidyalay, Kanpur Kalan, was the chief guest. Shree Pal Jain, Kamlapat Jain, Dr Anil Chandok and Mr P.K. Mehta also spoke on the occasion. Several cultural items were also presented by the students. Diljot Singh is a child of four, but hardly looks his age. His weight is 43 kg and height 4’4’’. His diet is on a par with any teenager. And his physical strength is tremendous. The only child of Ravinder Singh Randhawa and Amrit Kaur of Sherpur village in Chhachhrouli block of Yamunanagar, Diljot is popularly known as ‘chhota pehlwan’. 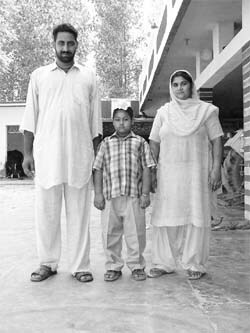 Though his parents themselves are well-built (Ravinder Singh is 6’6’’ and weighs 100 kg, while his wife is 5’8’’ and weighs 80 kg), their son’s above-normal height and weight is a cause of concern for them. They, however, maintain that Diljot is mentally and physically healthy and all his medical reports are “normal”. He loves eating chicken and can gulp half a litre of milk in no time. “At the time of his birth, he weighed 5.5 kg. We were happy to have such a healthy child. So, to ward off the evil eye, his grandmother did not let him out of the house till he was two years,” reacalls his mother. by the time he is 10 years,”says Ravinder Singh. Whilst the other kids play, Diljot helps his parents with household jobs. Cycling for several kilometers daily is, quite literally, child’s play for him. A student of Class I in MDAV High School, he is very witty, say the villagers. Sirsa-based poet and author Puran Mudgal has always believed in transcending lingual barriers through his writings. His book “Shabd Ke Aath Kadam” was based upon the lives and works of eight celebrated litterateurs, four each of Hindi and Punjabi. The book’s uniqueness lay in the fact that it compiled the biographical sketches of writers of two different languages in a single volume. In fact, the seeds of this novel tradition were sown long back when Mudgal, an MA in Hindi from Panjab University, began his career as an English teacher. His published works include three collections of poems and an equal number of translated books. His poems are also prescribed in the MA (Hindi) syllabus of Kurukshetra University. In continuation of his efforts towards enhancing linguistic ties, Mudgal has now translated — or rather trans-created, as he puts it — a Hindi novella into English. The writer claims that his English translation of Suganchand Muktesh’s novelette “Aparaajeya” under the title “I Am Fully Awake” is the first-ever translation of a Hindi novel by a Haryana writer. The protagonist of the novel is lying buried under the debris of his train compartment and heaps of sand following a devastating rail accident. With death looming large, he ponders over various aspects of life and emerges invincible. A layman’s search for truth is also craftily interwoven in the story. The translator has also inserted footnotes at various points to help the readers appreciate the legendary, historical and literary references in the novel. Born at Fazilka in Punjab in 1931, Mudgal retired as a Block Education Officer and is at present settled in Sirsa. He has been associated with a number of cultural and literary organisations and is engaged in freelance writing. The assassination of his father and former MLA, Principal Om Parkash Bagga, by militants in the summer of 1984, proved to be a turning point in the life of Dr Ajay Bagga, in charge of the school health programme, Hoshiarpur. The memory of the bullet-ridden, blood-soaked body of his father propelled him towards the blood donation movement. He felt that providing blood to the needy was the noblest way to save lives. Dr Bagga has not only been donating blood since the final year of his MBBS, but has also associated himself with some voluntary blood donors’ societies. To motivate people for blood donation, he leads by example, having donated blood more than 50 times. He has also got around 200 seminars organised in various schools, colleges, factories and at religious ceremonies. Besides, he is associated with the Eyes Donation Organisation. He is the author of a book titled “Jite Ji Rakt Daan and Marnoprant Ang Daan” and had distributed more than 1000 copies free of cost to motivate people to donate blood during their lifetime and other body organs after death. During his stint at the dispensary in Naru Nangal village in 1998, he, with the help of local MLA Tikshan Sud, got the dispensary building renovated and a 2-km-long approach road constructed. He and his wife Jai Shree have pledged to donate their eyes after death. The couple has also authorised their elder child, a daughter, to perform all the religious rites upon their death despite the fact that their second child is a male. The Punjab Government had awarded ‘parshansa patras’ to him in 1998 and 2005 for his contribution to the field of voluntary blood donation. He has also earlier been honoured by the Indian Red Cross Society, Punjab.